​Saquella Cafe is celebrating 13 years of business this year. While they have always been known for their amazing coffee and tasty pastries they have been offering much more for some time now. I had the opportunity to taste some of their amazing dinner menu items and was very impressed. Saquella has a European bakery feel with a menu that is Italian and Mediterranean inspired. They pride themselves on being a fry free kitchen and sourcing as many ingredients locally as they can; everything from fresh mozzarella cheese to local pita. We started off our night with a Cran-tini with cranberry infused vodka which is made in house. The best part was the fresh cranberries that were super tart. 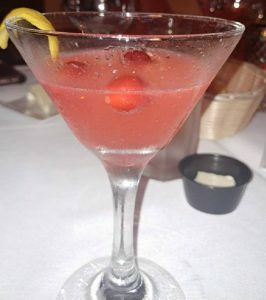 If you are a cranberry lover this is the perfect drink, if not don’t’ worry they have a great wine list and a full bar. 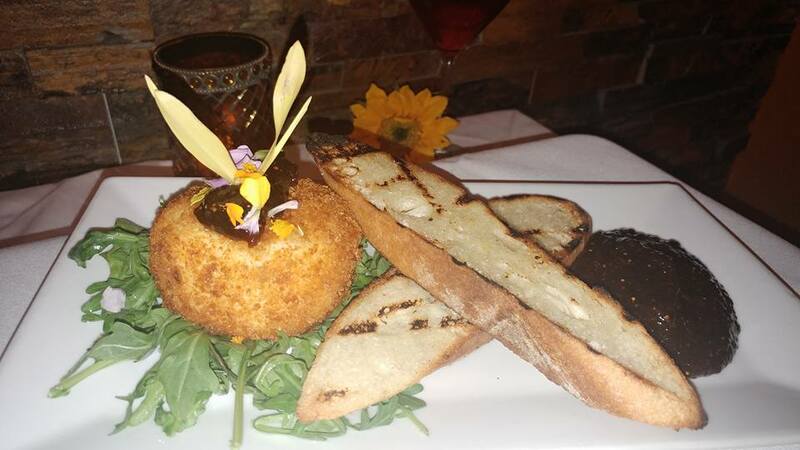 First up was the Goat Cheese Croquette’s which was one of my favorite dishes on the menu. The goat cheese was super creamy and not too tangy and it was served with grilled baguette and a fig jam that was delicious. Next up was the Medi’ Platter which was a whole plate of Mediterranean goodness. The platter had hummus, tahini, grilled veggies, pita, cauliflower with a lavender dressing that was to die for, and falafel. The falafel was some of the best I’ve had. And bonus is they are chick pea and quinoa based so they are gluten free, making this platter a great option for people with dietary restrictions. The shakshuka was by far my favorite dish we tasted. 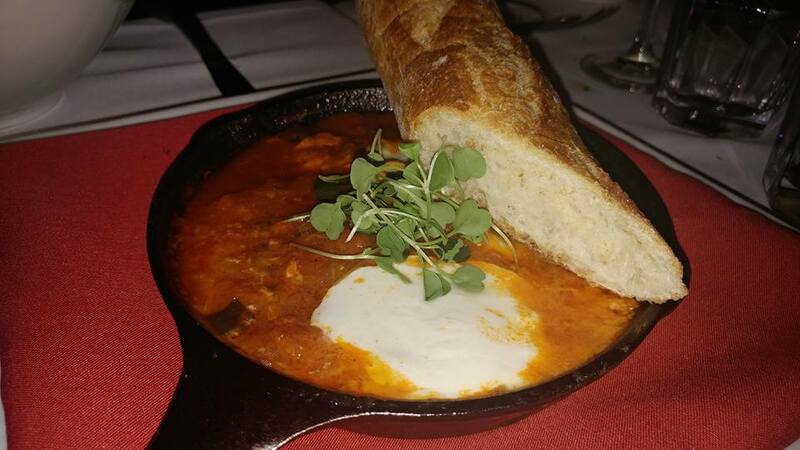 Shakshuka is a traditional middle eastern dish of poached eggs in a rustic tomato sauce and at Saquella they top it with fresh local made mozzarella. I’m a big egg fan so I love the concept of this dish but the sauce was to die for! 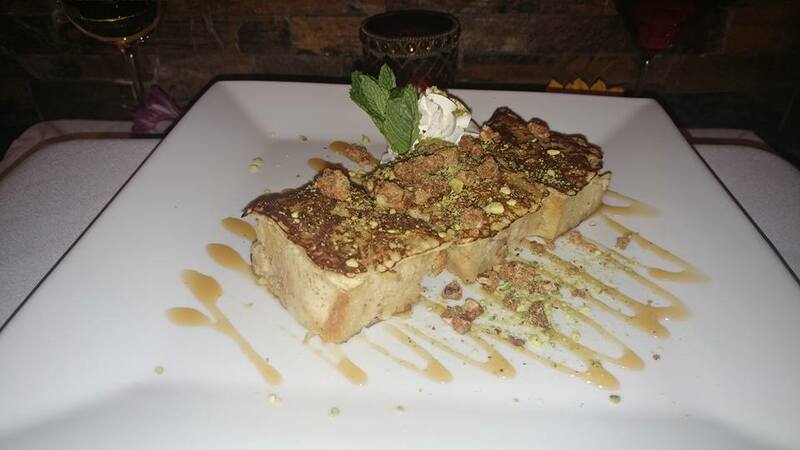 Plus it comes with fresh bread so that you can enjoy this dish in the traditional way by using the bread to eat it. Saquella offers a full dinner menu with dinner specials as well. The quinoa crusted salmon came on top of a roasted beet goat cheese puree and then it was topped with a fennel radish salad. Another dinner menu item was the Sunflower Seed Crusted Chicken with celery root puree, avocado, corn ammoglio and micro arugula. I loved the unique idea of encrusting with sunflower seeds and the presentation was beautiful! 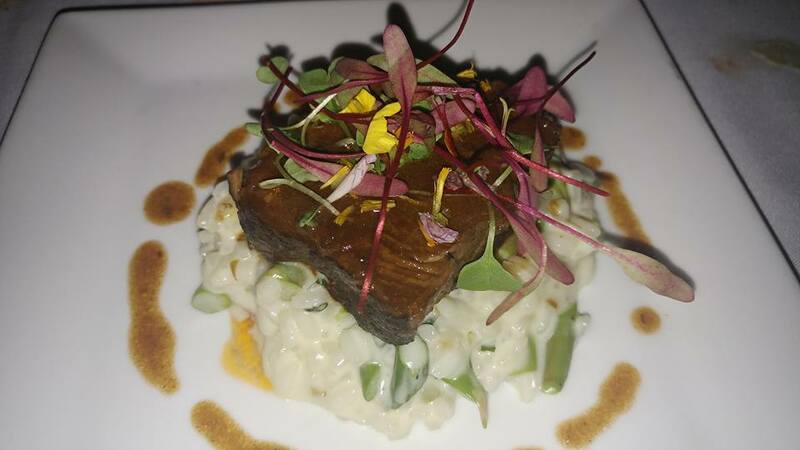 The last main dish of the evening was the 6 hour Short Rib Asparagus Risotto. This was the dish that everyone at the table couldn’t stop talking about. The short ribs melted in your mouth the risotto was perfectly cooked. With Saquella being a bake shop we of course finished out the night with a tasty array of desserts. The peach cobbler French toast was amazing (hint: this is actually on their brunch menu) and was topped with a bourbon salted caramel sauce and candied walnuts. 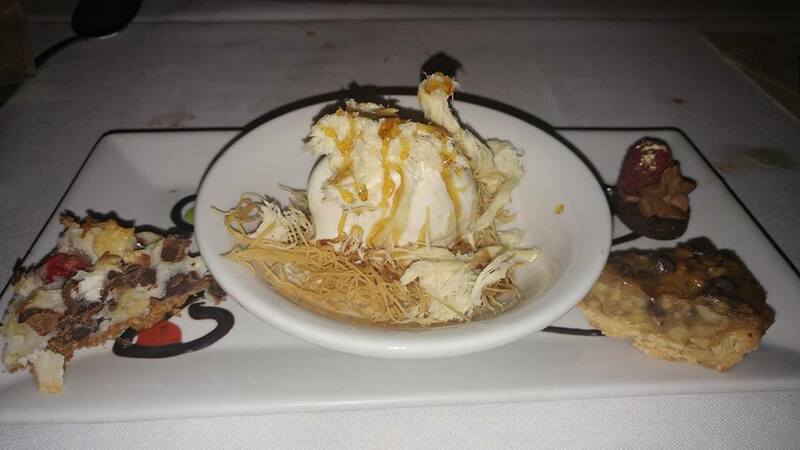 If the French toast wasn’t amazing enough, we also had the Medi’ Delight which was Petrini Vanilla Gelato (and if you’ve ever been to Saquella you know their gelato is amazing) on a kadaif nest with halva which is made from sesame paste. We also got a small sampling of some of their delicious pastries. To cap off the night we had an X Rated Affogato which was the perfect ending. 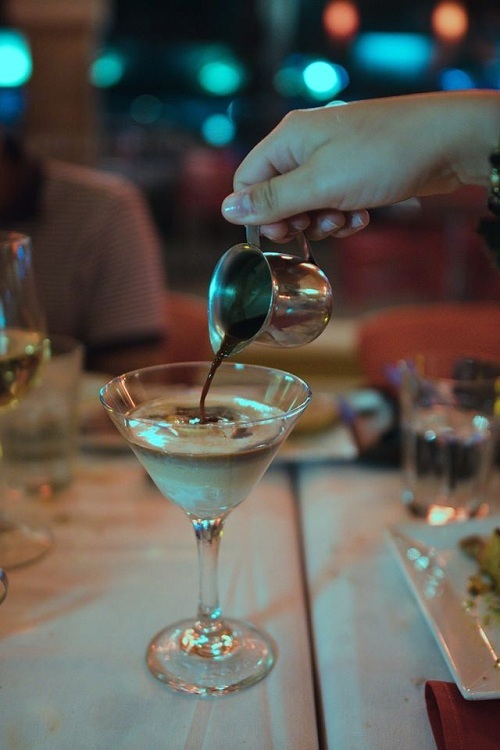 I’ve been to Saquella before specifically for their affogato (espresso or latte with gelato added in), the X rated version took that up a notch with some Marula cream liqueur for a perfect after dinner drink. And just because it’s Saquella and their coffee is amazing, we finished the light off with a latte. Saquella Café, Scratch Kitchen and Bake Shop, is located in Royal Palm Plaza in Boca Raton and is open for breakfast, brunch, lunch and dinner. Megan is a contributor for The South Florida Sage. She is a trained chef, registered dietitian and food photographer. She has a total love affair with food. You can find her on instagram @foodinfocusphoto and online at foodinfocus.photography. All images appearing in this post photographed by Megan Huard. Disclaimer: I received a complimentary tasting at ​Saquella Cafe. First I have to confess my love for this place upfront. We are both South Florida natives and moved to Boca in 2004. Royal Palm Plaza was struggling to attract quality tenants and we frequented the wine bar behind them, but as far as eateries went there was not much to choose from. Coffee? A wasteland. We enjoyed good coffee and wanted a breakfast and lunch place to hang our hat. When Abraham Sekerel (Avi) opened Saquella in 2005 he partnered with an Italian roaster named Saquella, known throughout Italy for their fine coffee. This early partnership spawned a local phenomenon. Combining a snappy decor (when was the last time you saw chandeliers in a cafe?) that had class yet was unpretentious- easy to sit and enjoy what turned out to be the finest cappuccino in South Florida. To compliment the fine Italian coffee he added an in-house bakery and a made from scratch kitchen using the finest top quality ingredients. Soon the word was out. Breakfast and lunch would never be the same, offering healthy alternatives to fast food including vegan side dishes, and introducing South Florida to a European staple- a salad with every entree. I soon became hooked on the egg, meat and cheese Croissant with the salad side. Even as Mizner and Royal Palm Plaza filled with new restaurants of every description Saquella expanded to open Prosecco Cafe on PGA, and a third location The Grill at The Bridges in Delray Beach. These two newer versions emphasized dinner over breakfast and lunch and for the last two years Saquella’s original location has offered it as well. A new dinner and brunch menu has been launched and Chef David Fogel wanted to have us sample his new creations. With a background from the University of Michigan and the Culinary Institute of America as well as private Chef duties and stints at Bocaire and Boca Woods his offerings will redefine the “Cafe” experience you may have imagined. These stack up with any fine dining experience locally with a fresh take on favorites and some surprises too. NOT TO BE MISSED! Lets start with Goat Cheese Croquettes sweetened with home made fig jam and honey. Chewy and delicious! Next comes a perennial favorite the Medi’ Platter . This is a dish that can both satisfy the Vegan and Omnivore and can be shared. Roasted fresh seasonal vegetables, hummus, falafel, tahini with wedges of warm pita bread. The Mediterranean Platter is a meal in itself. Not to heavy yet packed with flavor, something missing in many presentations locally. Yes, you can have flavor AND not be over seasoned. This is a testament to the careful selection of local fresh ingredients guided with a skilled hand. Shakshuka….hearty Middle Eastern dish popular in Israel. A breakfast dish I had never heard of until this meal. Brought to the table in a traditional iron skillet and a shareable serving of their homemade crusty warm bread. Vitos Mozzarella and poached egg top this dish. The sauce would stand up to any Italian kitchen standards, roasted flavors throughout. 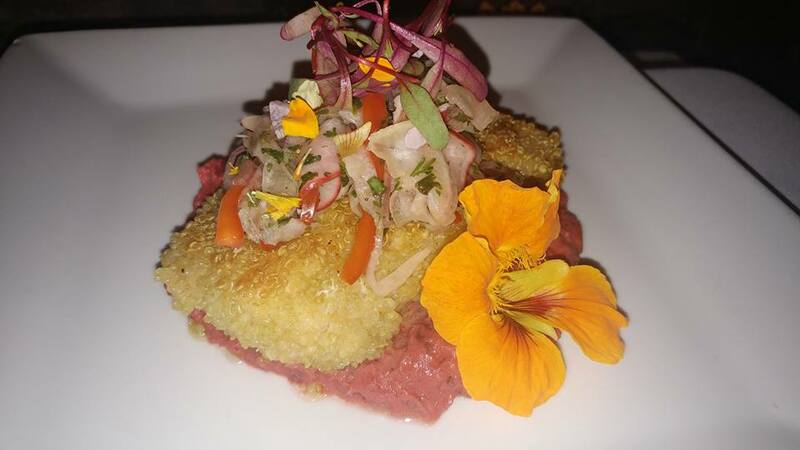 Once only off the the menu item this dish is now always available… Quinoa Crusted Salmon. Roasted beet and goat cheese puree with a fennel and radish turshi. You won’t find it better anywhere. Avi chose a new chicken dish for our next plating. This was especially surprising. 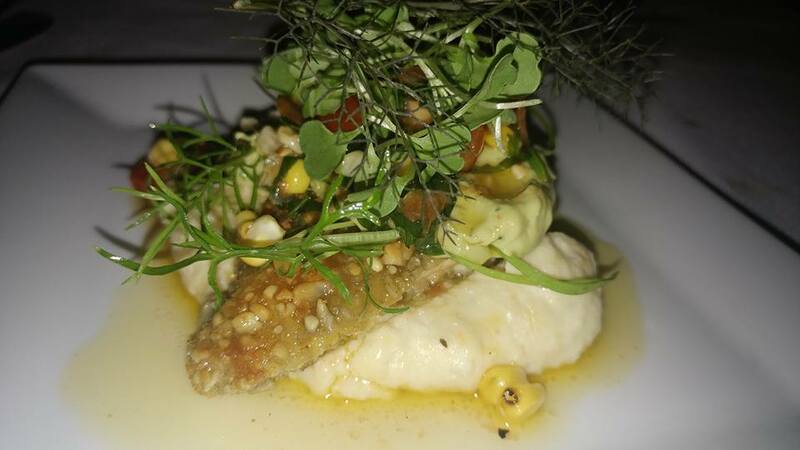 Sunflower seed chicken breast, celery root puree complimenting an Avocado & Corn Ammoglio topped with micro arugula. This dish was moist and full of flavor with the sunflower seeds adding an earthy tone. For the meat lover.a new version of their 6 hour short rib with asparagus and Asiago risotto drizzled with a rich short rib reduction. This literally fell apart at the touch of my fork. The risotto added the necessary creamy element and the asparagus gave it a crunchy snap to the dish. Come hungry for this dish! Saquella makes full use of their bakery and Baker to produce a wide range of fresh, house made deserts. This is special which I implore you to leave room or order a sample to take home. As is our practice, no monetary compensation was received for this review. Our drinks and food were complimentary.